They say that birds are descended from dinosaurs. Maybe the T-Rex should be the official mascot of Thanksgiving, after Ralph the Rex and his friends went after some Christmas decorations put out too early! It's not even officially fall yet! The first day of Fall is September 13th, but already some shops are getting ready for Christmas. Newsround - Is September too early to start thinking about Christmas? A few weeks ago, a Tesco supermarket in Cambridge even put their own big Christmas tree up outside the store - with 117 days to go until 25 December. 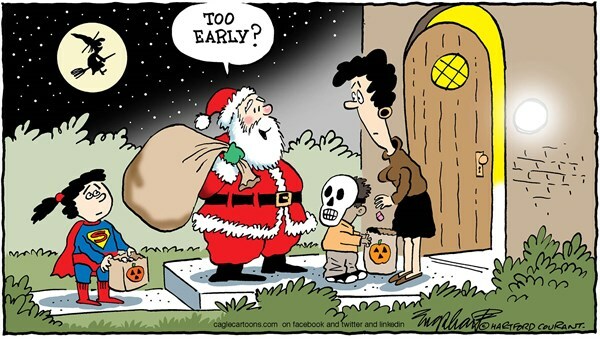 We still have Halloween and Thanksgiving seasons to enjoy! Keep those Christmas decorations in the closet for a few more months! From over at: how the h* did i end up here? As stores are getting ready to line up their Christmas displays to make all that holiday money, hopefully they are paying attention to the other holidays too. A report just came out saying a whole bunch of people are going to be spending a whole bunch of money on Halloween stuff. Hopefully your fall season is filled with pumpkin spice, some cooler evenings, maybe some cider and donuts, and of course shopping for those Halloween costumes. Word on the street is that some of the stores have already put their Christmas decorations out! The Christmas Creep might be a little frantic this year after Toys R Us declared Chapter 11 bankruptcy! There were a lot of changes for the positive last year, with a lot of stores closing their doors on Thanksgiving Day so that families could be together for the holiday. 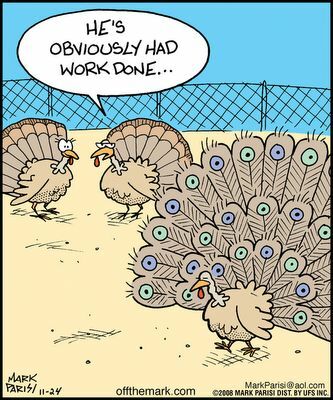 Hopefully those good feelings keep up this year, and every learns to #RespectTheTurkey! Jack-o-lantern: Well big guy, looks like it's your turn. It's only two days after Halloween and I've already seen Christmas lights, fruitcake and scented pinecones. Turkey: Hopefully by next year they will skip over Thanksgiving completely!! 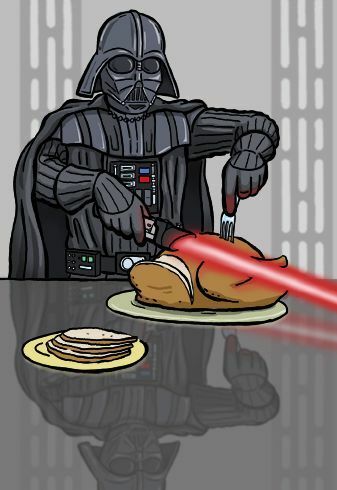 Hope everyone is enjoying their Thanksgiving day with family and friends. 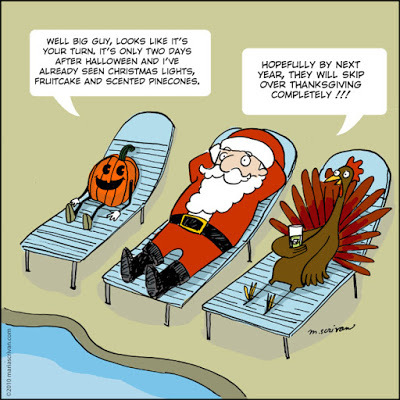 Here are some fun cartoons to give you a chuckle while you gobble. Turducken? Too complicated! The best I can do is Turstuffen.